New sprinting supremo Santa Ana Lane made a top class sprint field look second rate when he stormed home to win the 2019 Group 1 $2.5m Aquis T J Smith Stakes (1200m) on Day One Of The Championships at Randwick today. Santa Ana Lane, above, scores a dominant win in the 2019 T J Smith Stakes at Randwick. Photo by Steve Hart. The Anthony Freedman trained Santa Ana Lane ($7.50) collected his fifth Group 1 winning trophy when Mark Zahra brought him from near last on the home to turn to record a three and a half lengths win over his nearest rival Osborne Bulls ($4 favourite). Tony McEvoy’s brave filly Sunlight ($6) tried hard in the run to the line to gain third spot after having a tough run from the outside gate. The $101 chance Champagne Cuddles was a close up fourth while Pierata ($6.50) was fifth in a blanket finish for the minor placings. Santa Ana Lane won his fourth Group 1 during the 2018 Melbourne Spring Carnival with victory in the $1m VRC Sprint Classic (1200m) at Flemington and has one lead up run into the T J Smith Stakes with a fifth to Sunlight in the Group 1 $1.25m Seppelt Newmarket Handicap (1200m) at Flemington on March 9. Santa Ana Lane jumped from barrier eight in the eleven horse T J Smith Stakes and Zahara let him settle near the tail of the field while Kerrin McEvoy let Redzel slide to the front after jumping quickly and the Peter and Paul Snowden sprinter seemed to settle well in front. McEvoy nursed Redzel up the rise but the dual Everest winner had no answer when the challenges came from everywhere. Hugh Bowman stuck to the inside on Osborne Bulls while Zahra was happy to put Santa Ana Lane into open spaces and the six year old revelled in the soft conditions to record a dynamic win. Freedman is now considering an overseas campaign for Santa Ana Lane with Hong Kong and Europe in the pipeline. “We will obviously give Hong Kong serious thought and if things are still good we will head on to Europe,” Freedman said. 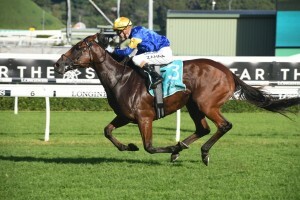 The post Santa Ana Lane beats top class sprint field in 2019 T J Smith Stakes appeared first on HorseRacing.com.au.